Your hair is fine, perhaps even very fine... There are two explanations: either it's the nature of your hair, or you are starting to lose it. To enhance your hair, check out our expert's personalised advice in order to choose a suitable haircut. Which haircut suits my fine hair? "Go for a haircut which is slightly layered and mid-length and leave some thickness on top of your head. This kind of haircut is perfect for giving an impression of volume. Above all, you shouldn't excessively layer your hair. You will risk making it thinner. Your aim: to prevent people being able to see through your hair. But also, to find the perfect illusion, which will help to conceal the lack of depth. "Say goodbye to hair which is too long in order to avoid the 'rat's tail' effect!" "Furthermore, very short haircuts are made for you! With shaved or part shaved hair, people will not be able to detect that your hair is fine. As a bonus, in the mornings, your hair will only require a quick once over in the bathroom. You will remain well-styled in all situations!" Which styling products are good for your fine hair? Once you have got a new cut, styling products will quickly become your best allies. They will allow you to personalise your haircut, whilst maximising the volume of your hair. So, go for a product which will coat the hair fibre, without making it heavy. The ideal product? 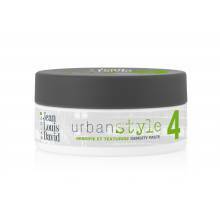 Density Paste gel from the Urban Style range. Apply only a small amount so your hair doesn't stick together - this will instantly remove any effects of depth. Furthermore, Texture Powder or styling wax can also work, provided you only use them in small quantities."